The "p" stands for "potenz" (this means the potential to be) and the "H" stands for Hydrogen. So you write pH with a lower case (little) p and an upper case (capital) H. Writing PH would mean a public house, writing Ph would mean philosophy as in PhD which means a Doctor of Philosophy. 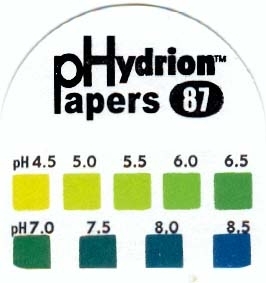 Any solution with a pH below 7 (i.e. pH 1.0 to pH 6.9) is an acid and any solution with a pH above 7 (i.e. pH 7.1 to pH 14) is an alkali. Neutral solutions (distilled water) are neither acidic nor alkaline so their pH is 7- this is neutral. An ill and/or mineral deficient person usually has their pH mildly to strongly acidic between 6.0 to 4.5, where 4.5 may indicate very serious problem. When taking a saliva pH test with litmus paper it is best to do it first thing in the morning, or during the day after two hours with no foods or drikns. Save a small sample of your first morning urine. Take a strip of pH paper and dip it into the urine sample. Compare the color of the paper to the color chart. The pH of a healthy person urine is between 6.0 - 6.4 in the morning, and 6.4 - 7.0 in the evening. Write down the value with the date and time, do it for few days to get avarage, keep the log, do it every months for a few days.